STAR WARS fans rejoice as a new immersive hotel is to open in Disneyland Florida, complete with character storylines for every guest. Every young Jedi wannabe can now get the chance to be a part of their very own story. Disneyland Florida has announced the opening of a new Star Wars hotel at the D23 Expo earlier this week. It is to be part of Disney World’s Star Wars: Galaxy Edge land and is due to open in 2019. The new opening is certainly an exciting one for any young fan wanting to be in their own Star Wars story. The new hotel boasts a fully immersive experience, where guests get their own character and costumes during the stay and even engage in lightsaber battles. 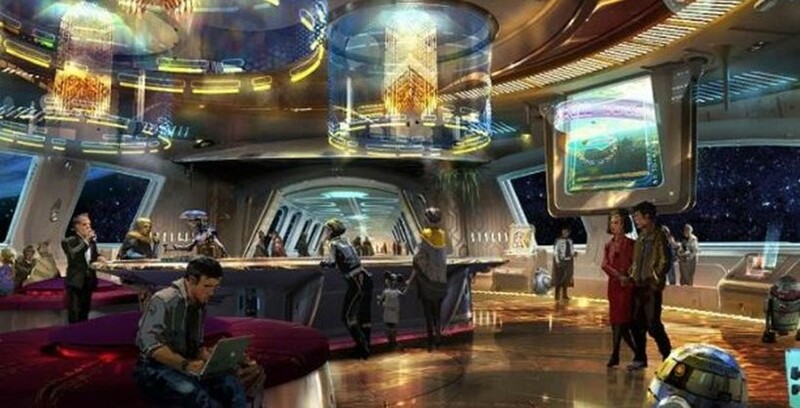 All of the hotel staff will also be in character and costume, in a hotel designed to look like a spaceship. It has been compared to the famous TV show Westworld, where guests can become their character by even building reputations, skills and follow plot lines. To keep up the illusion, the windows will even have a fake view into space instead of the view of Florida. Bob Chapek, Chairman of Walt Disney Parks and Resorts explained the full guest experience to be expected. “It’s unlike anything that exists today. From the second you arrive, you will become a part of a Star Wars story. “You’ll immediately become a citizen of the galaxy and experience all that entails. “Once you leave Earth, you will discover a starship alive with characters, stories, and adventures that unfold all around you.